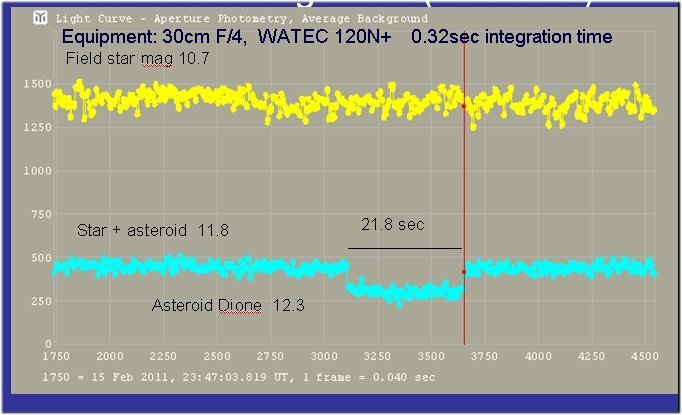 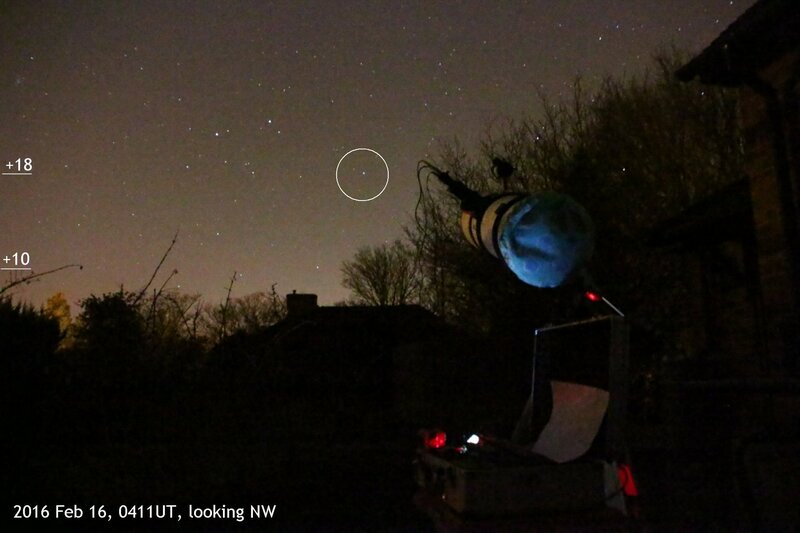 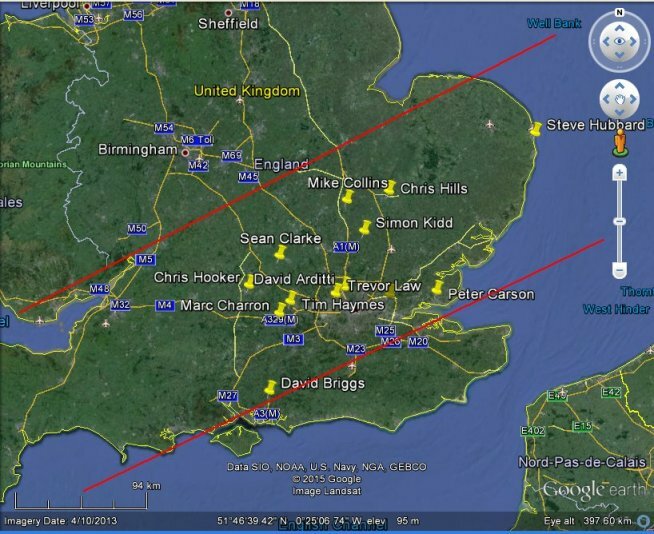 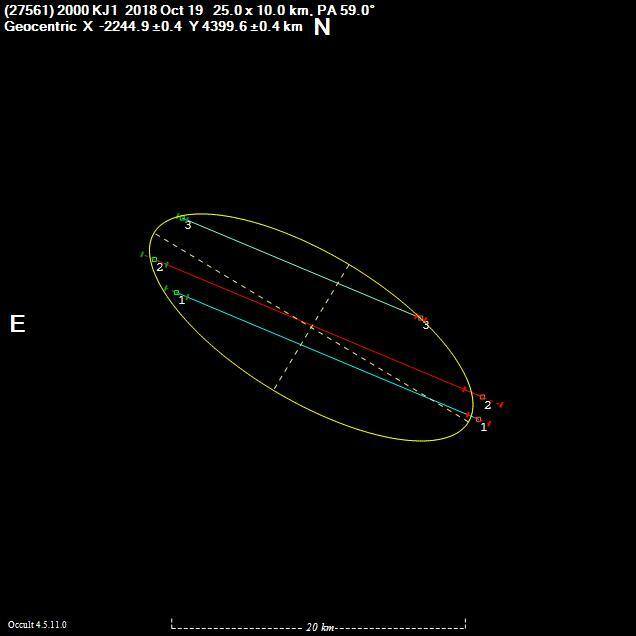 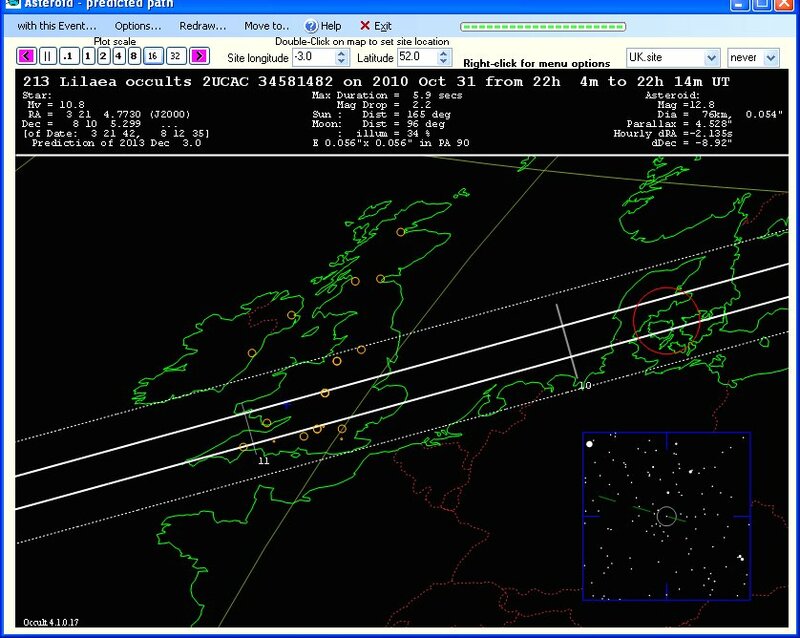 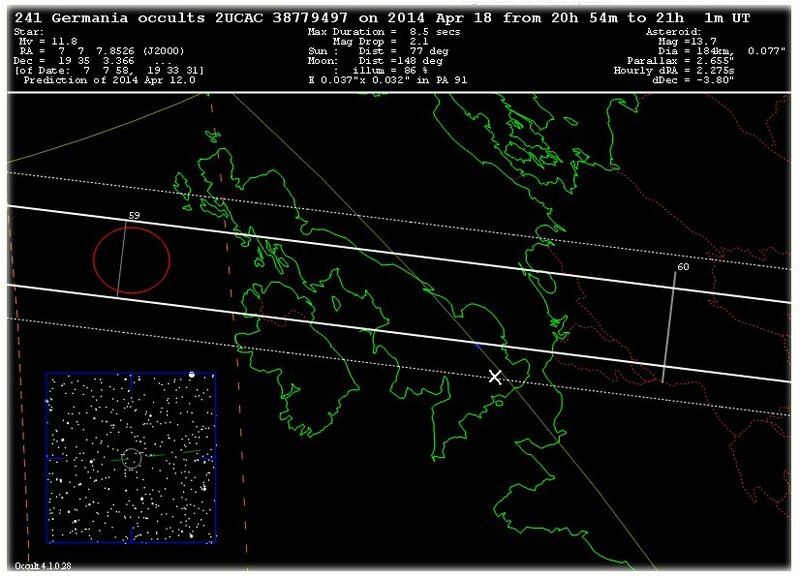 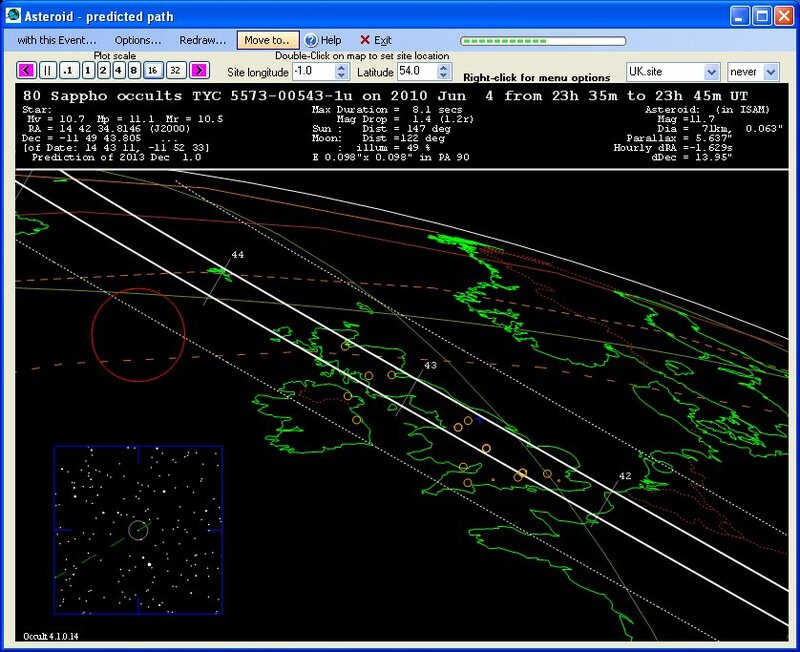 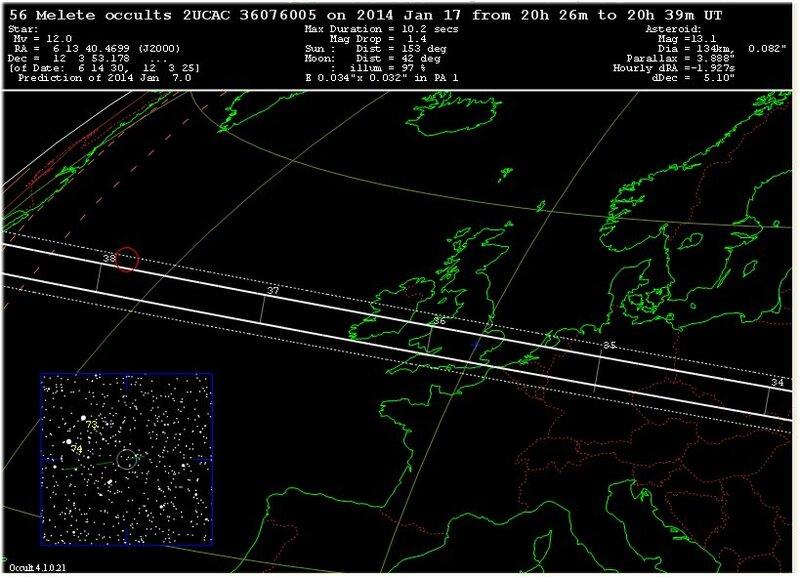 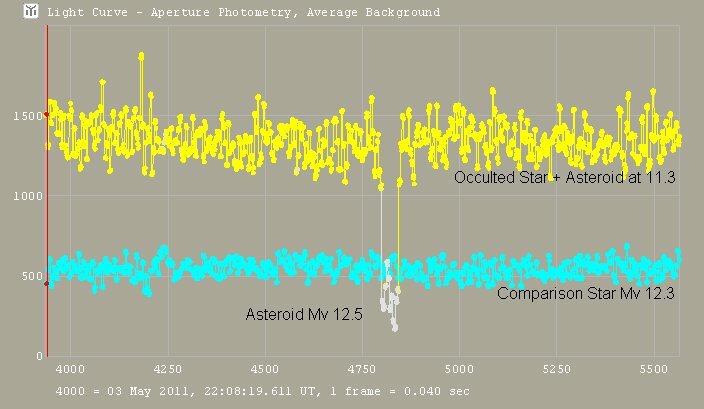 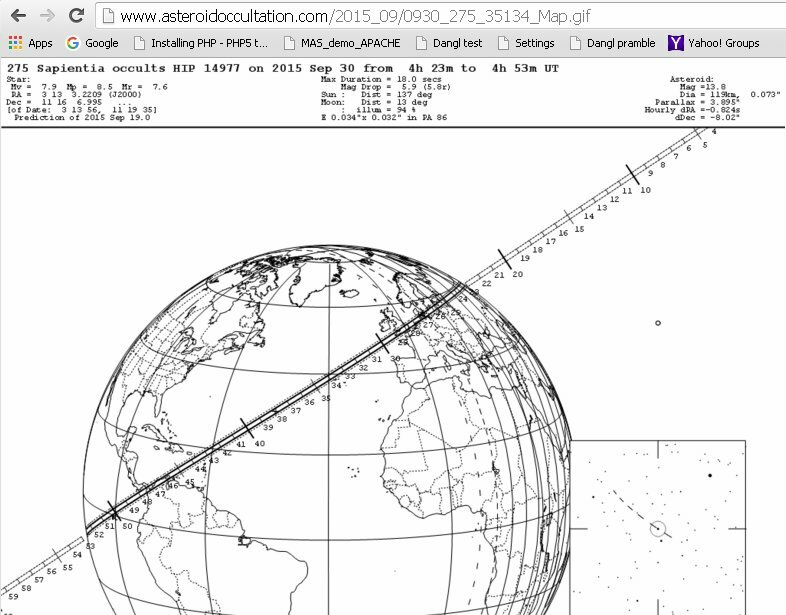 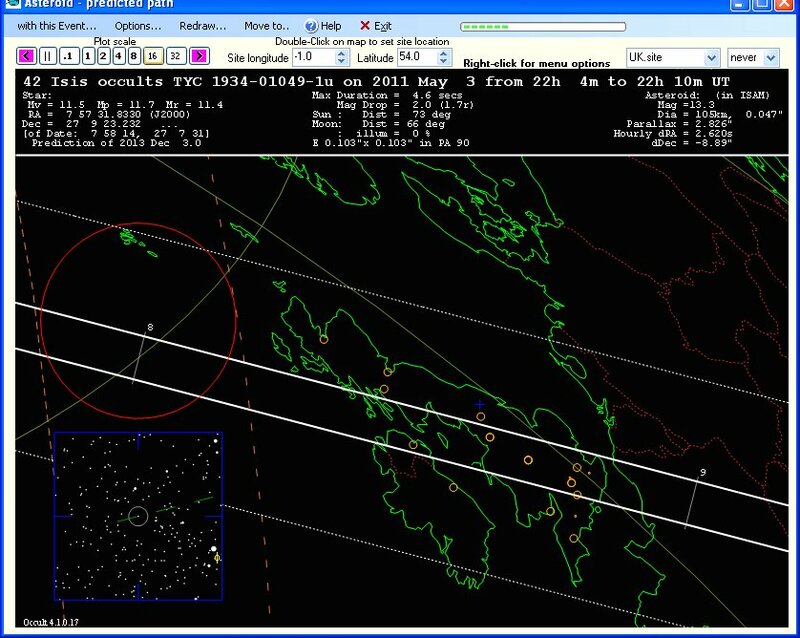 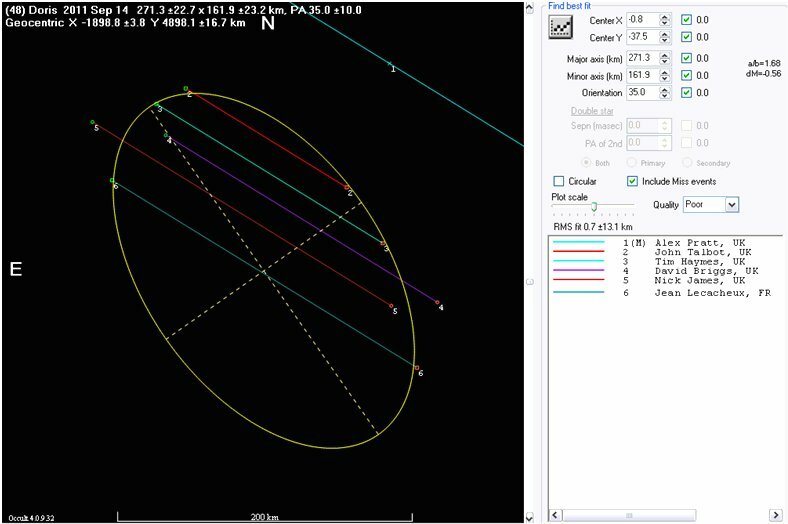 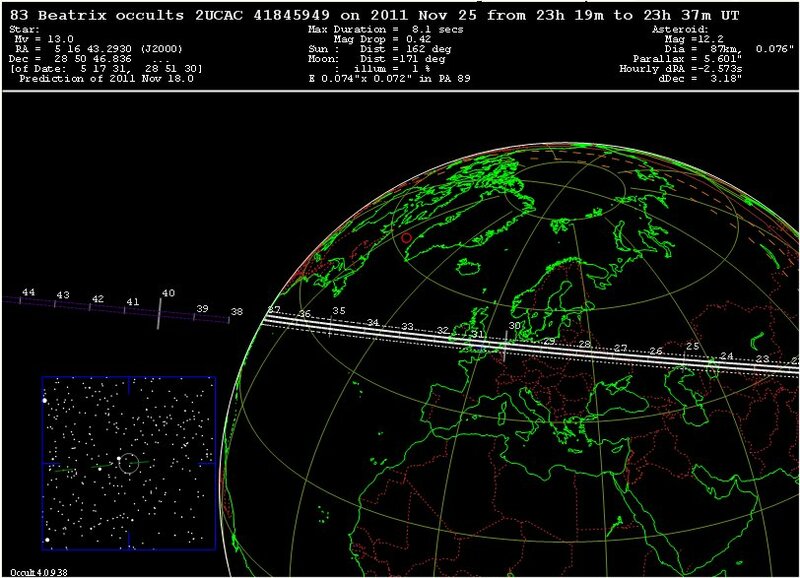 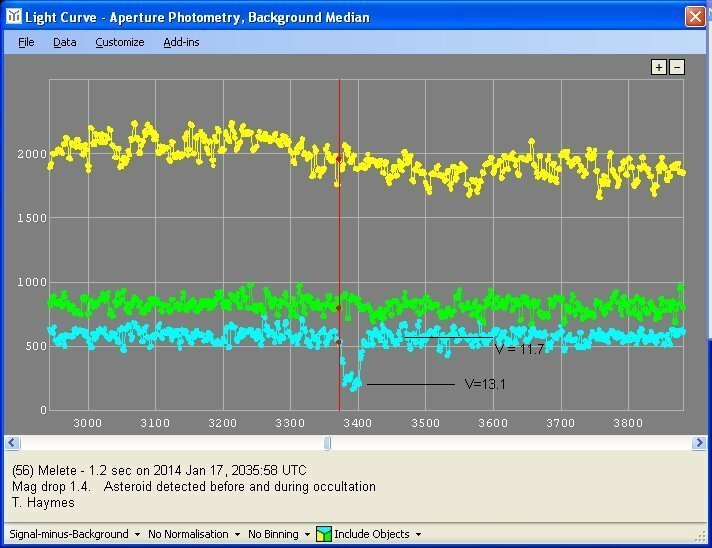 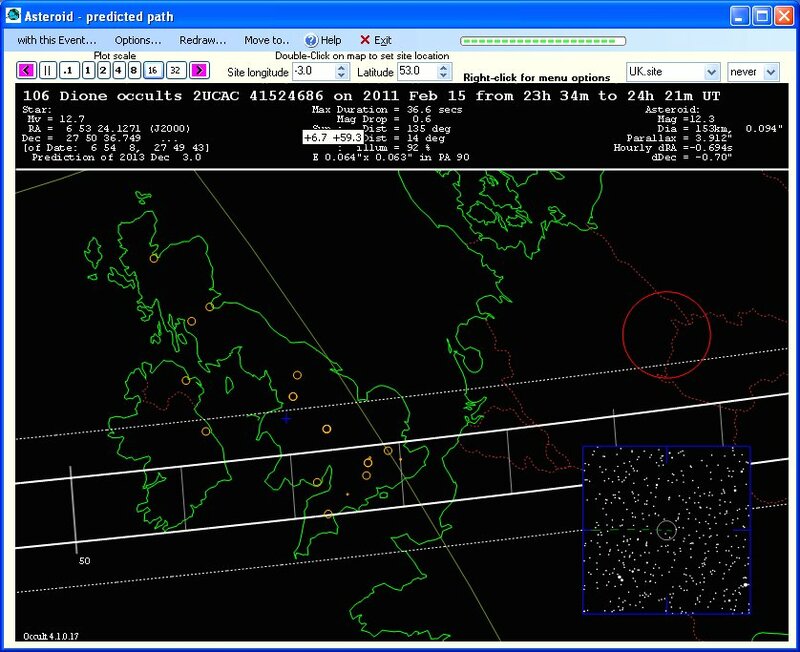 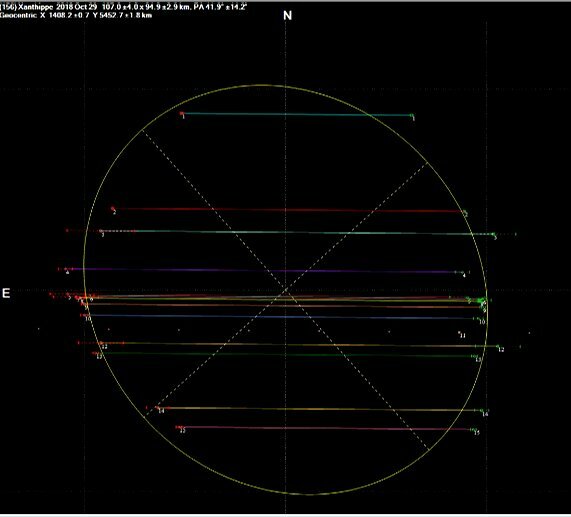 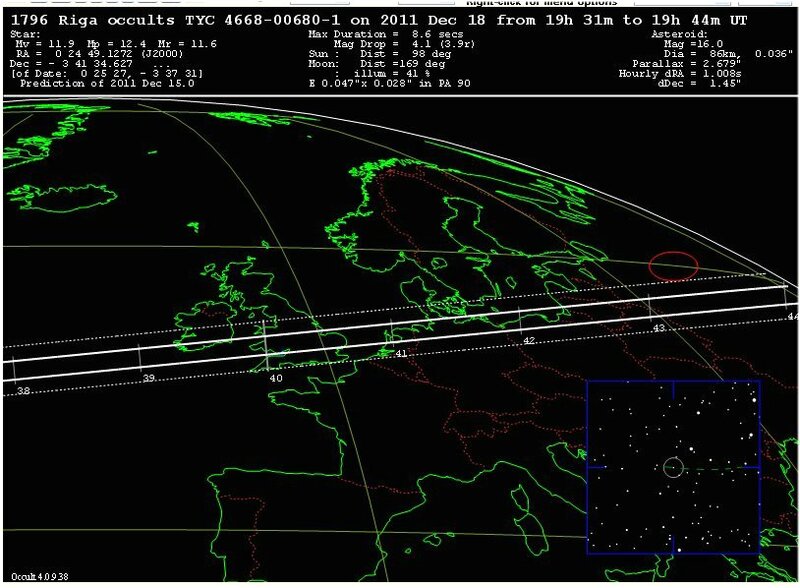 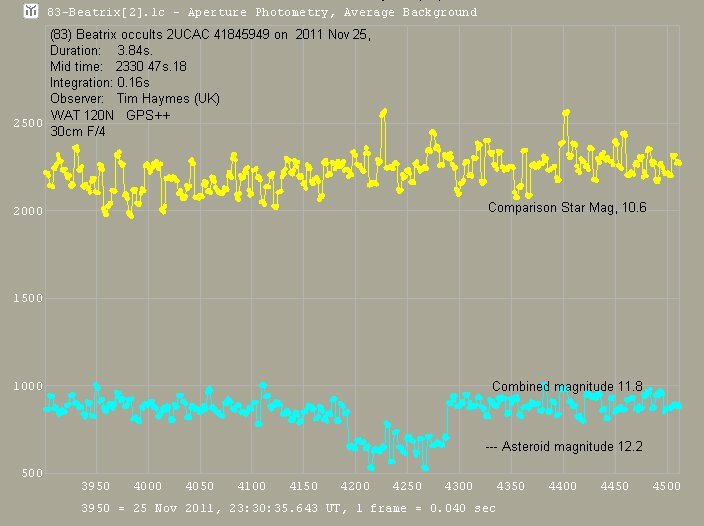 Mostly +ve occultations, 2010 to present. 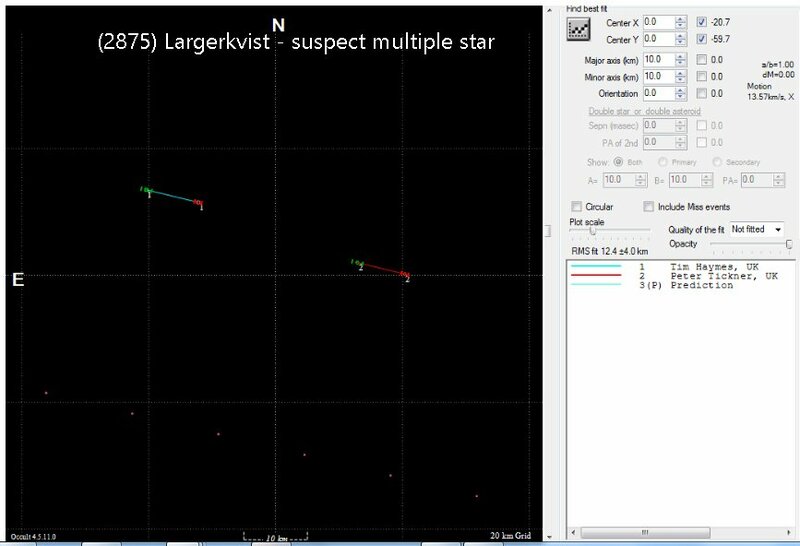 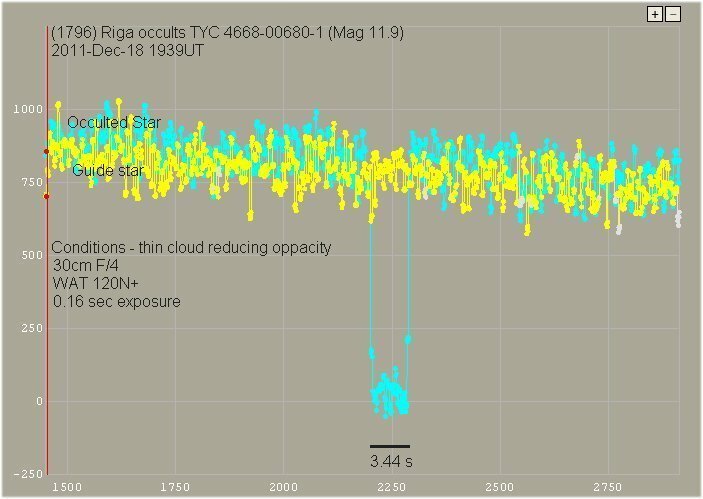 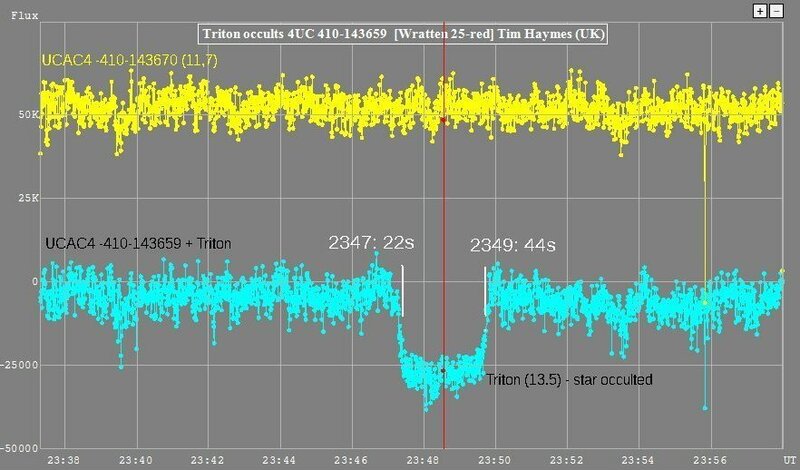 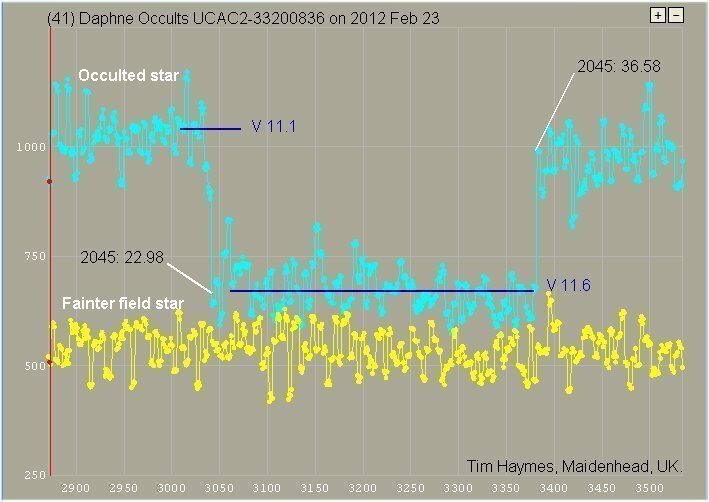 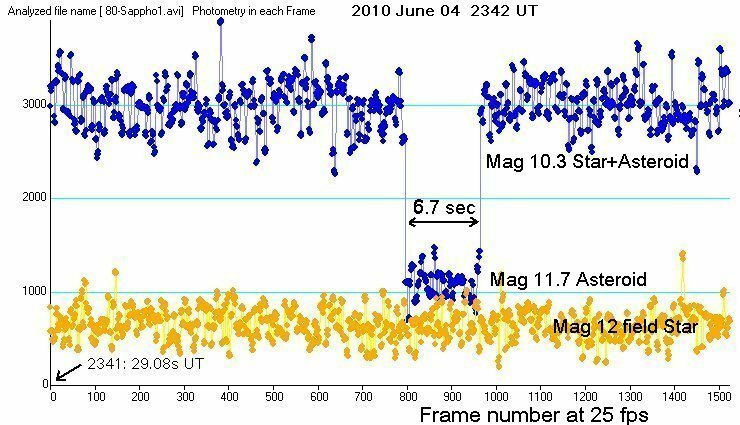 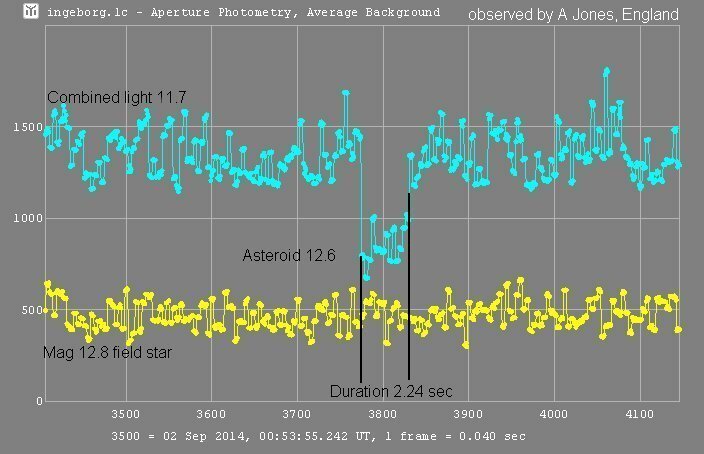 Highlight: More than 50 reports in one year was exceeded in 2018 with 8 positives recorded, one was an unexplained double star event. 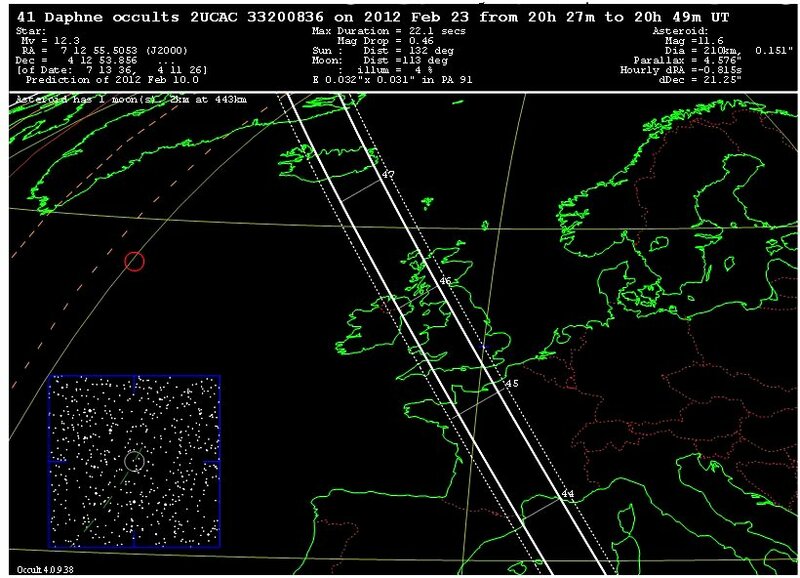 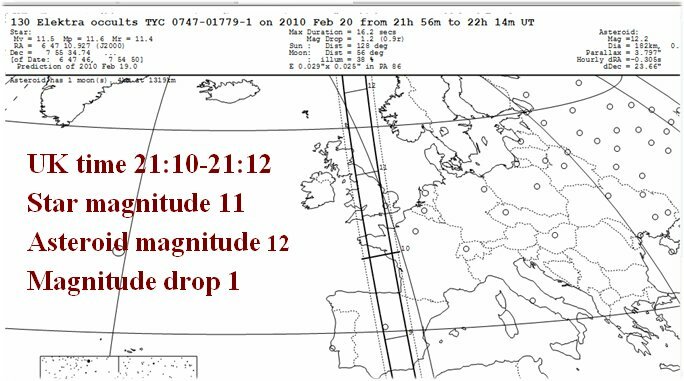 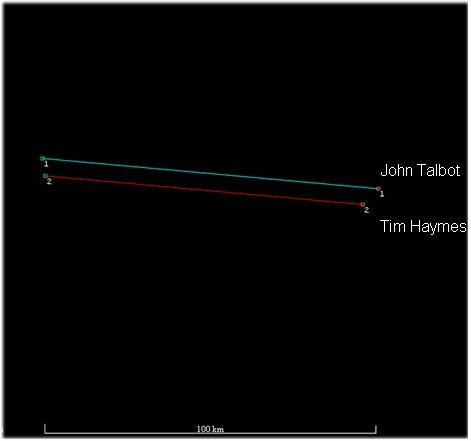 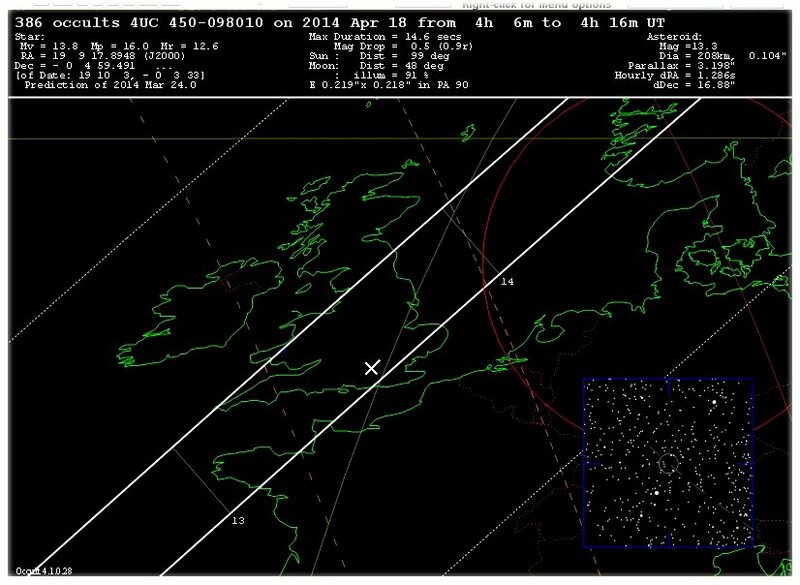 My interest in observing and monitoring asteroid occultations started in 1979 when predictions were first produced by Gordon Taylor in the BAA Handbook. 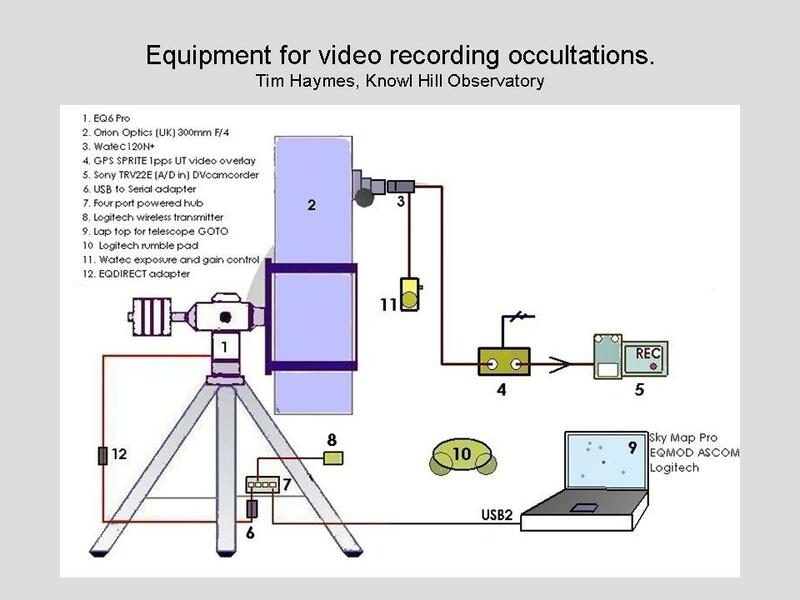 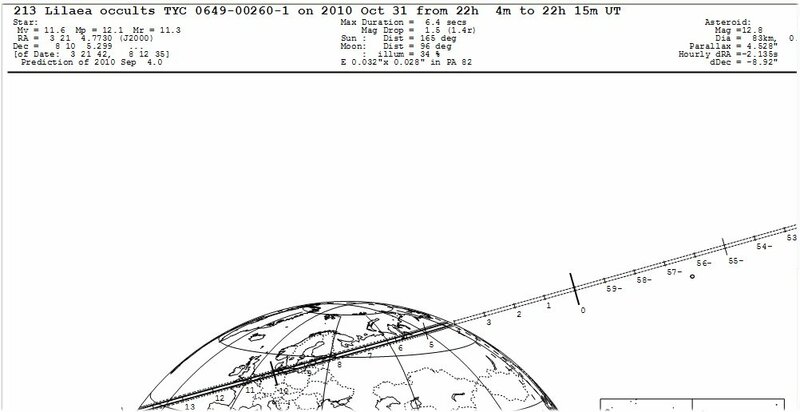 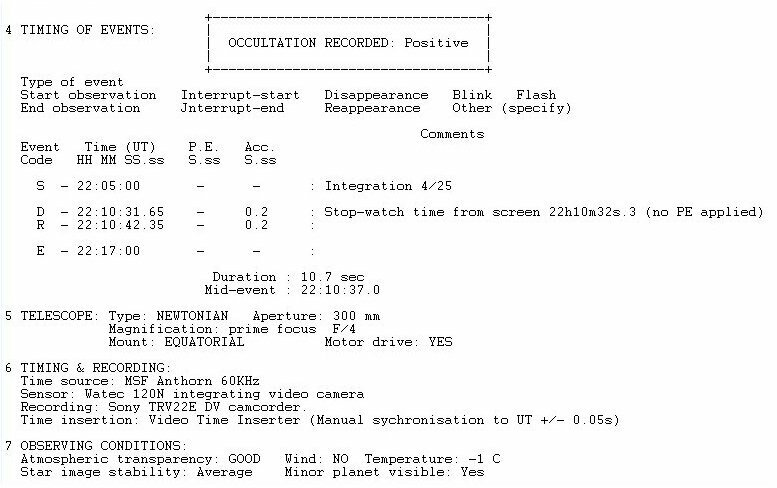 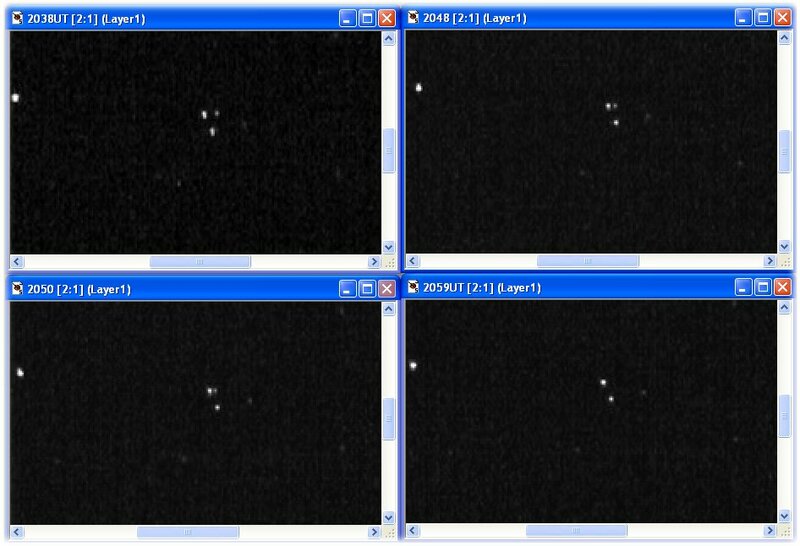 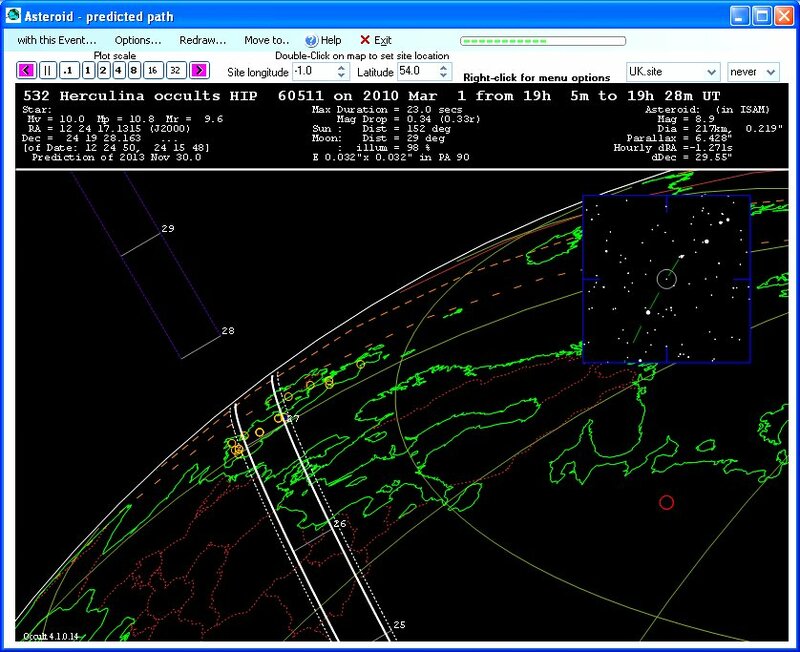 From about 1990 I was becoming a more frequent observer using low-light video with help from the late Andrew Elliott ( Assistant Director of the BAA Asteroid and Remote Planets Section 1990-2010). 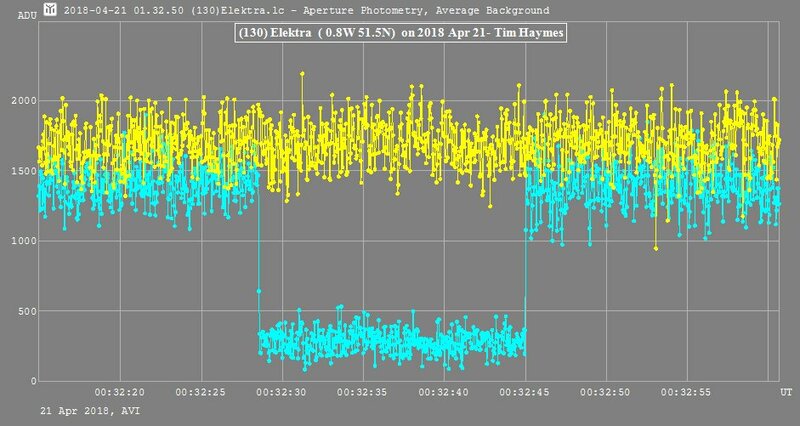 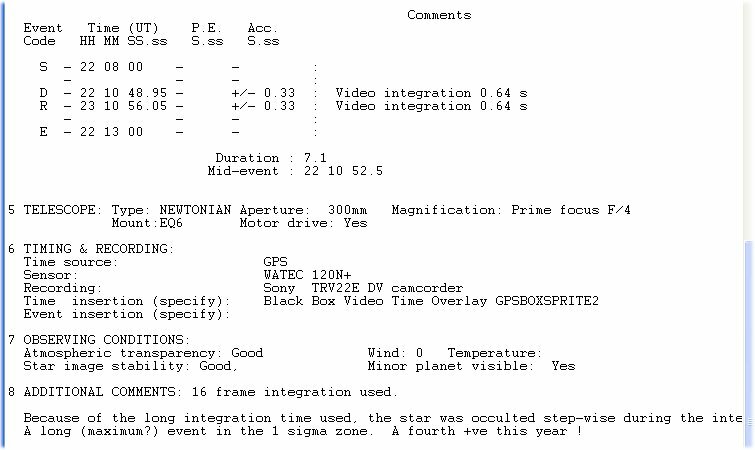 Up till 2003 I was using a Philips security camera module (25fps) sometimes with a Micro Channel Plate image intensifier on an 8" F/6 Newtonian. 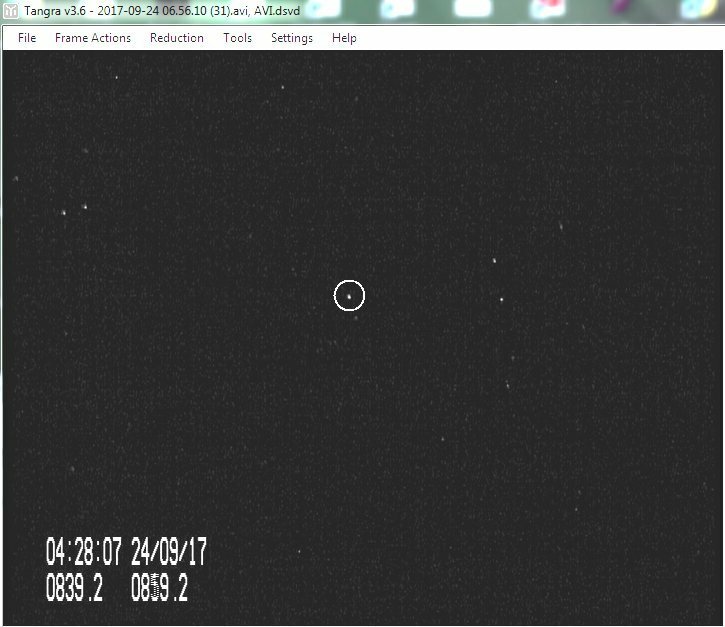 When the camera malfunctioned I purchased the integrating WAT 120N+ and a manual sync VTI from Maplin. 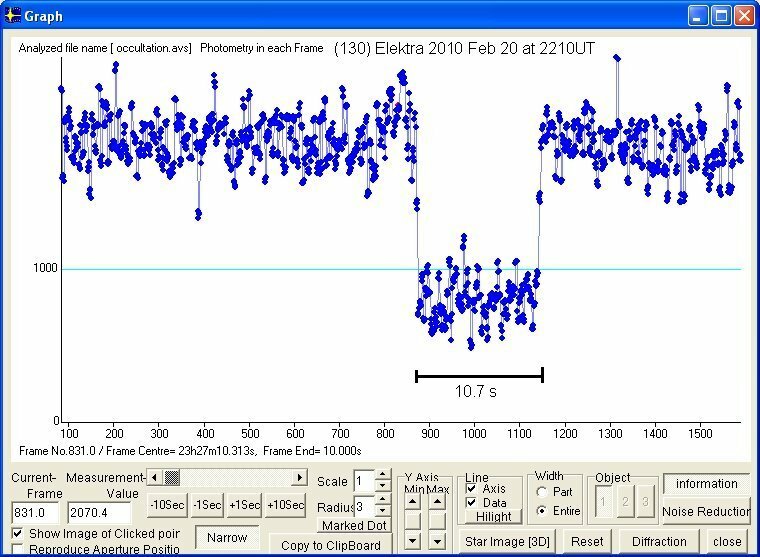 The first dissappearanec-reappearance was of (130) Elektra, which was recorded by video in 2010. 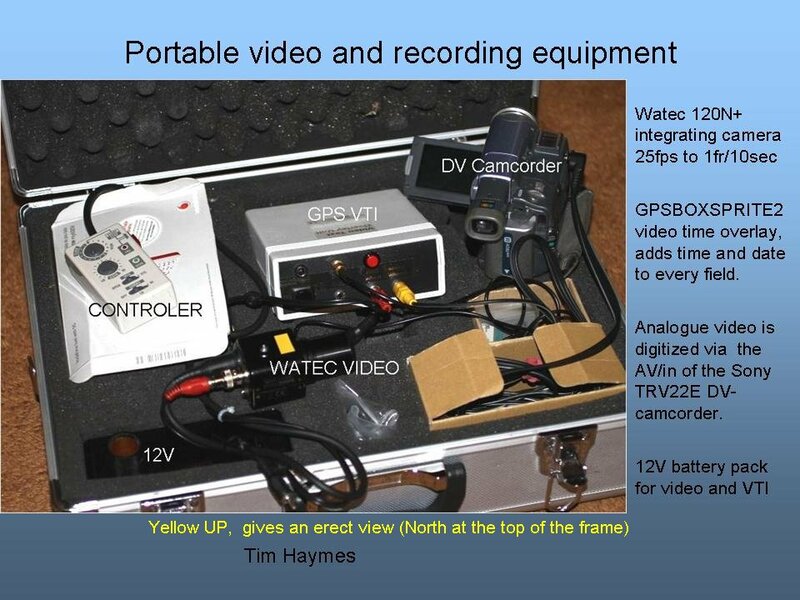 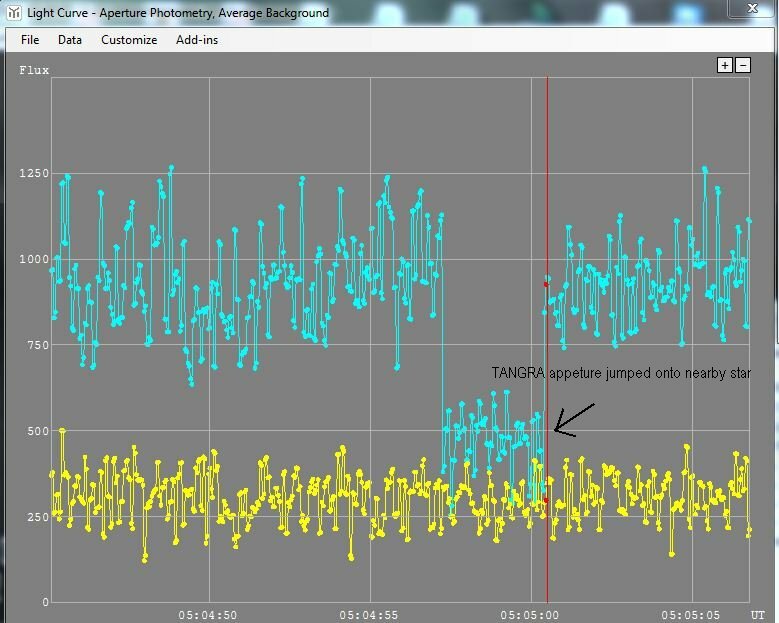 I'm now exclusively a video observer using GPS as time source. 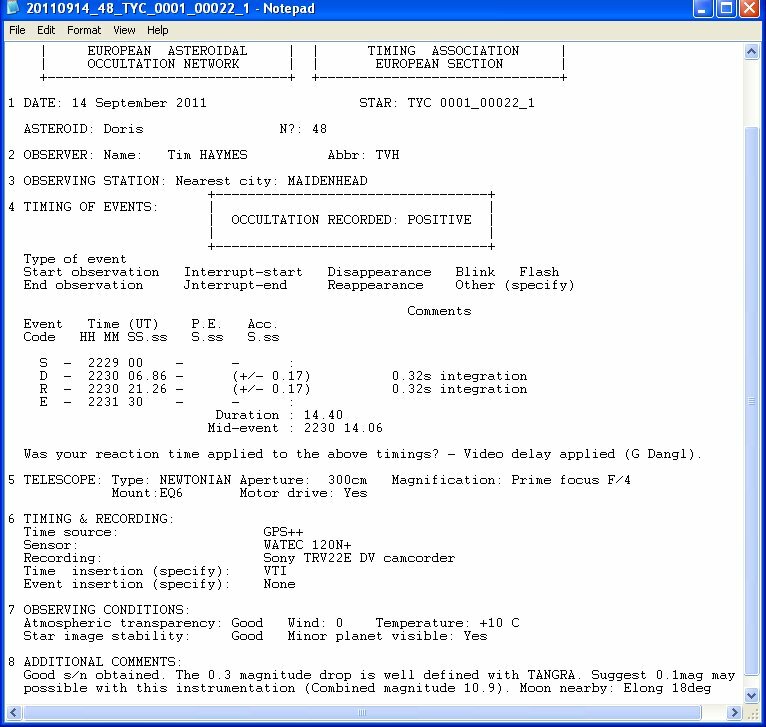 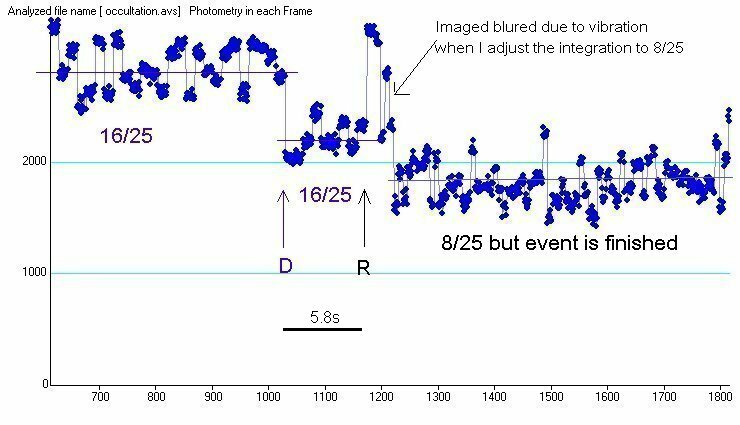 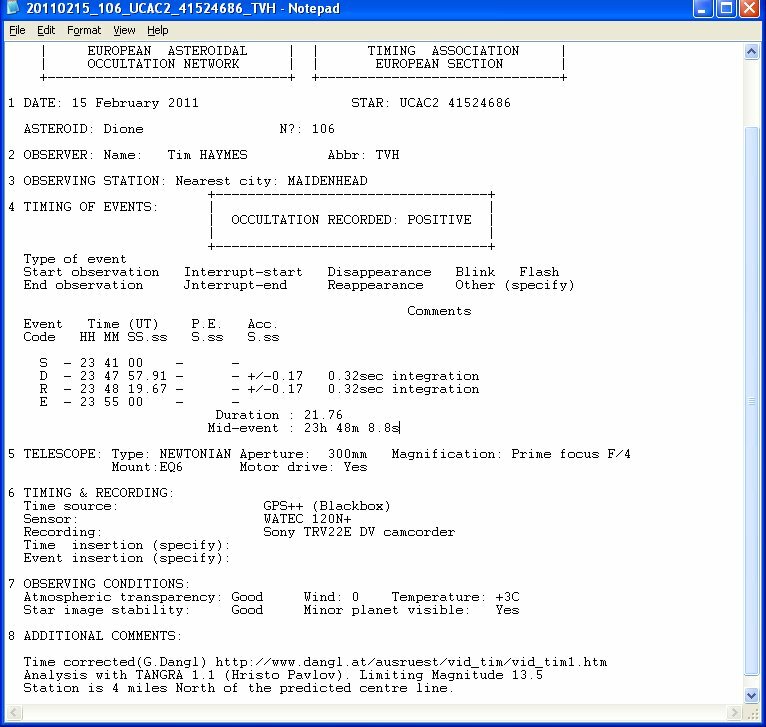 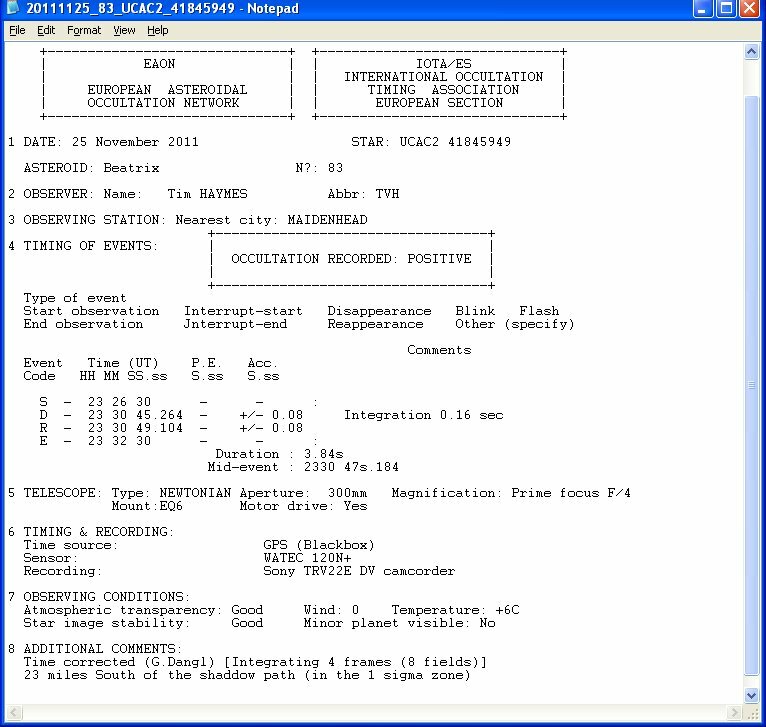 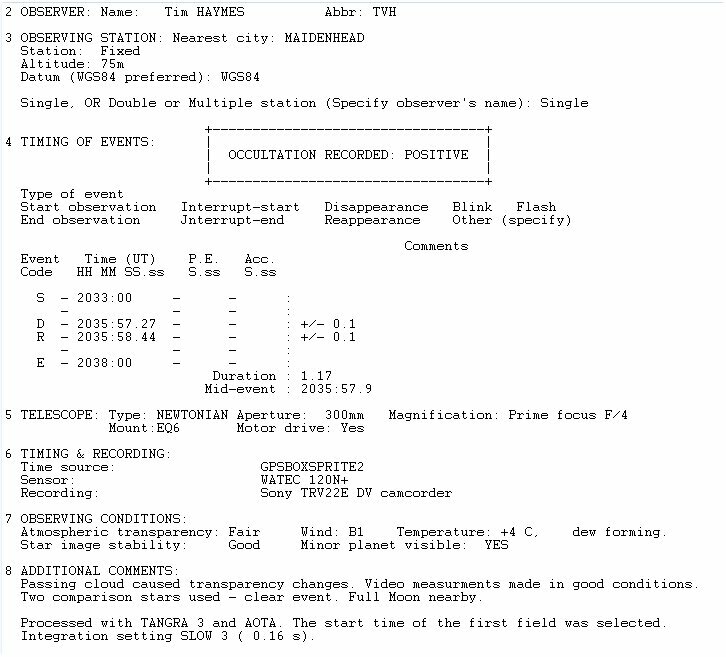 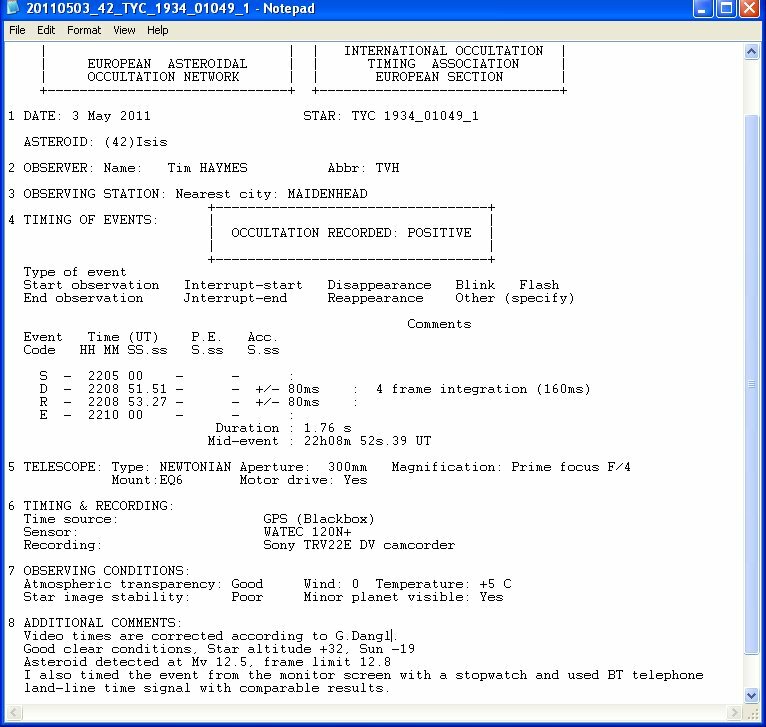 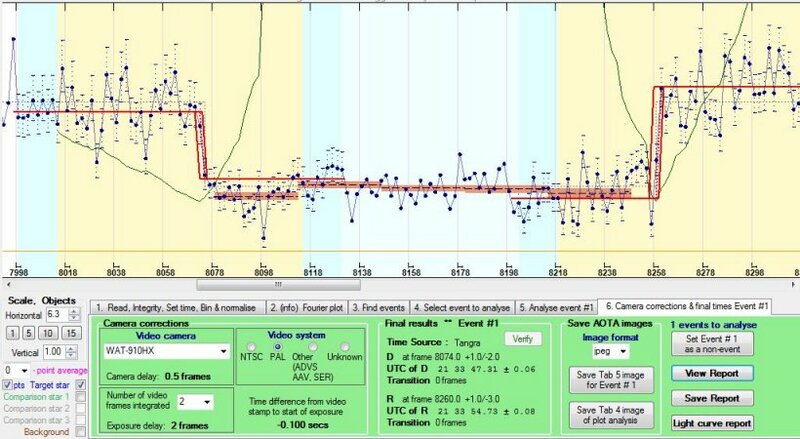 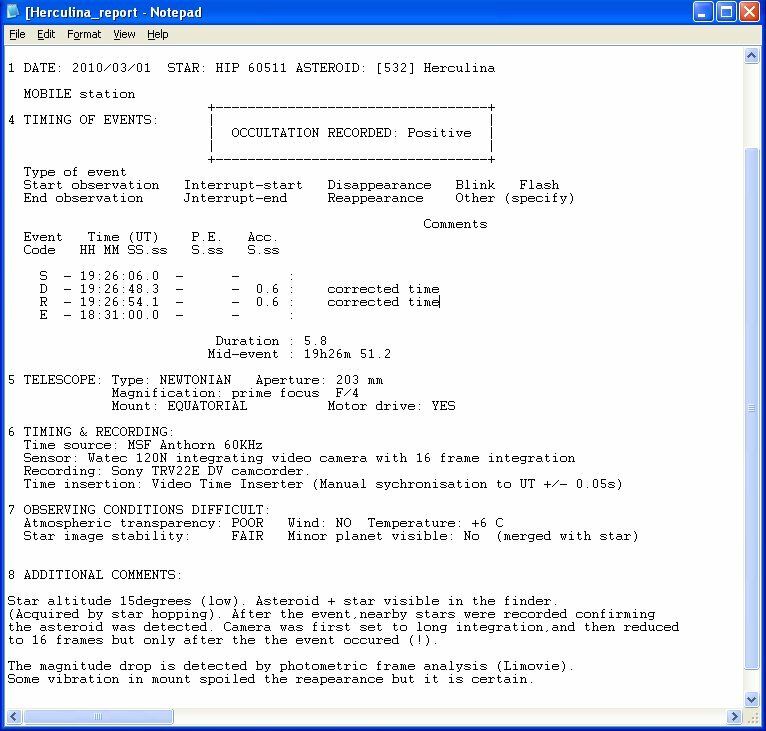 This page summaries the positive events recorded mostly with a 30cm F/4 Newtonian or a 20cm F/4 mobile instrument. 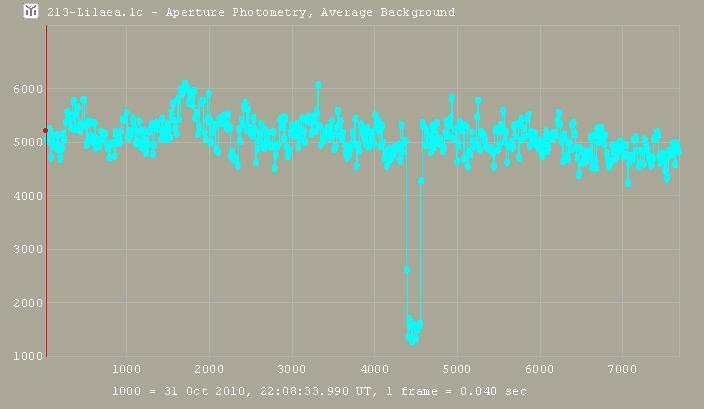 Bar Graph: The proportion in green are the +ve events. 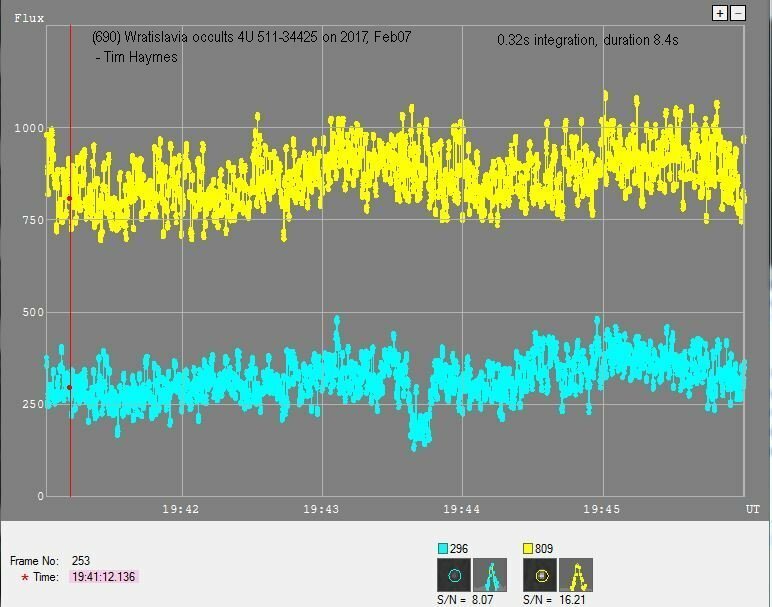 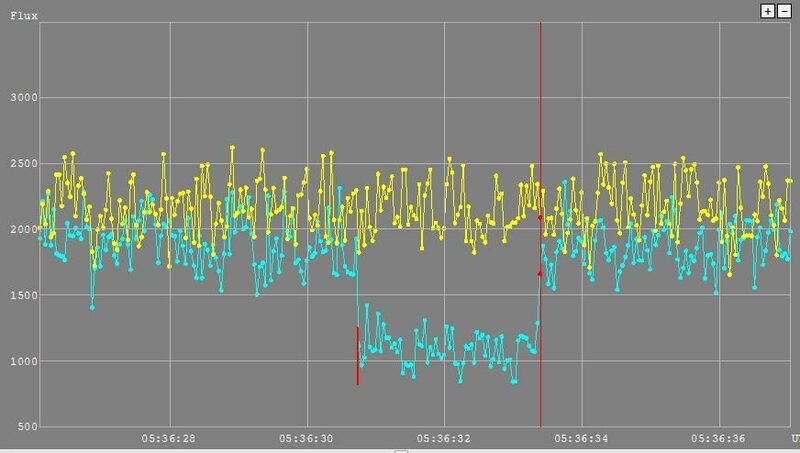 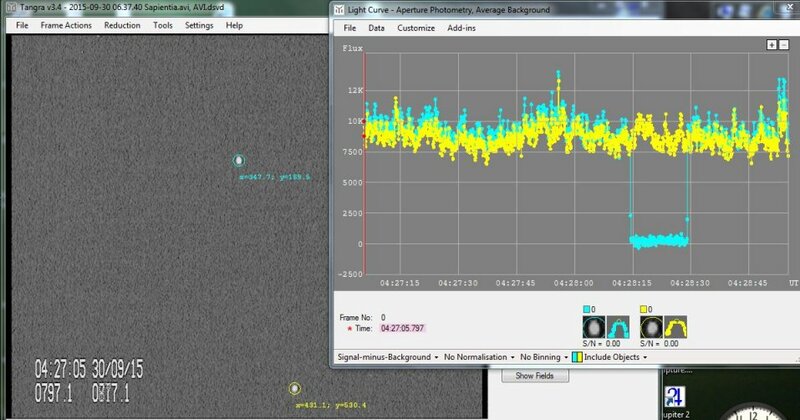 Planetary satellites are in yellow: Titan/28Sgr in 1989 July, and Triton in 2017 Oct.
Colour code to exposure times:: BLUE = with a 30cm F4 reflector Yellow = with a 203mm F4 Schmidt Newtonian. 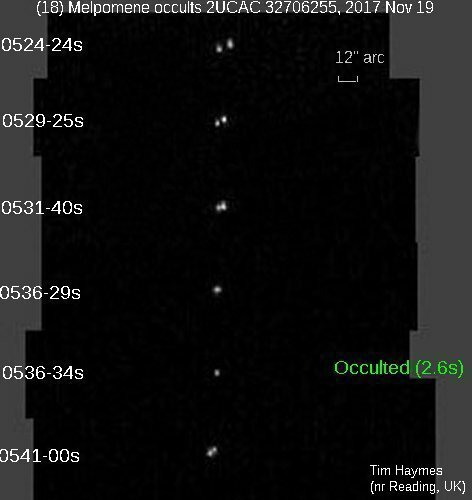 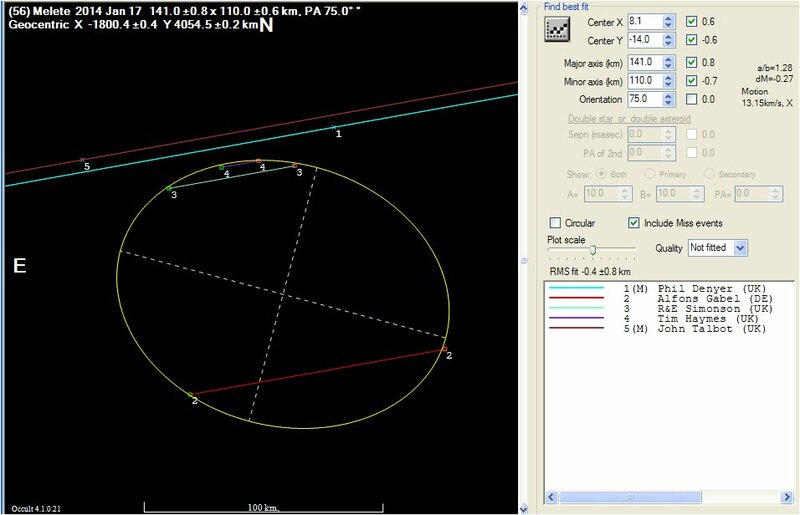 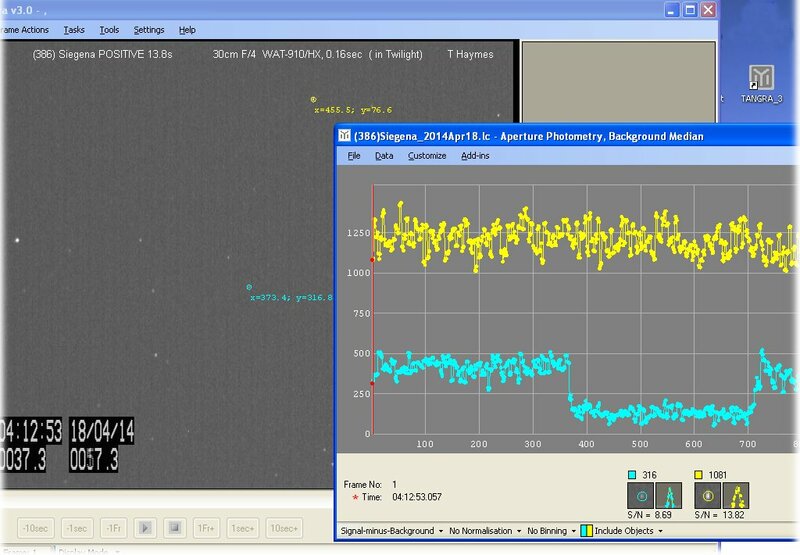 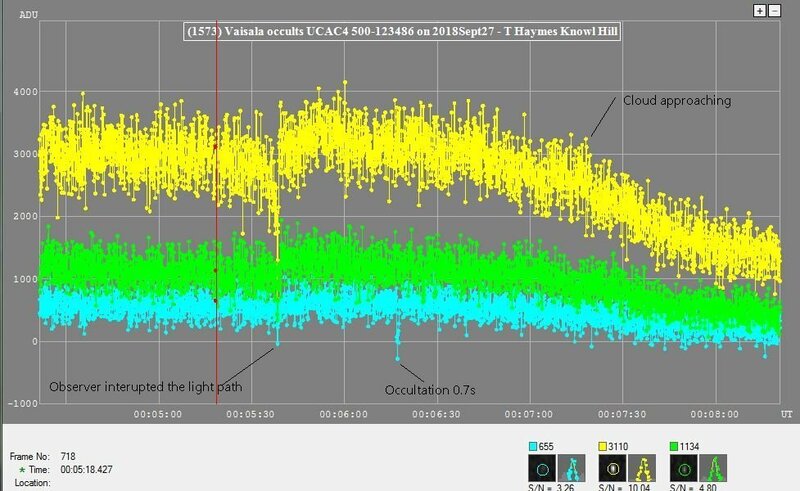 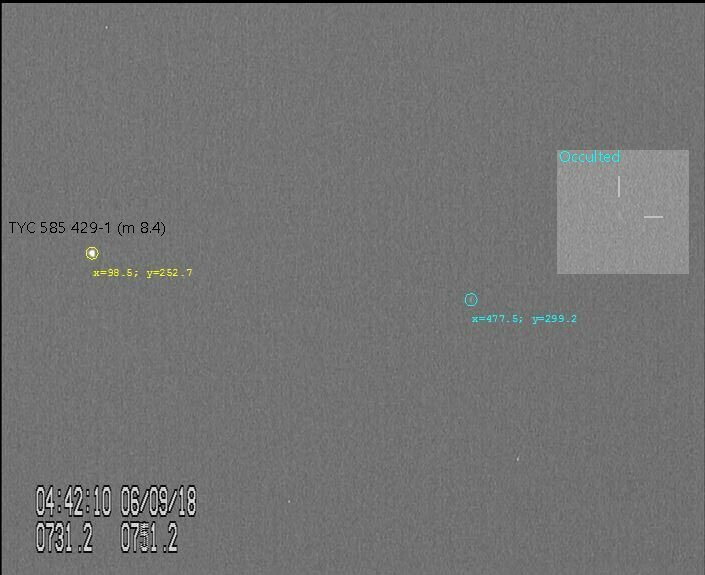 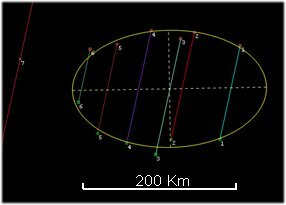 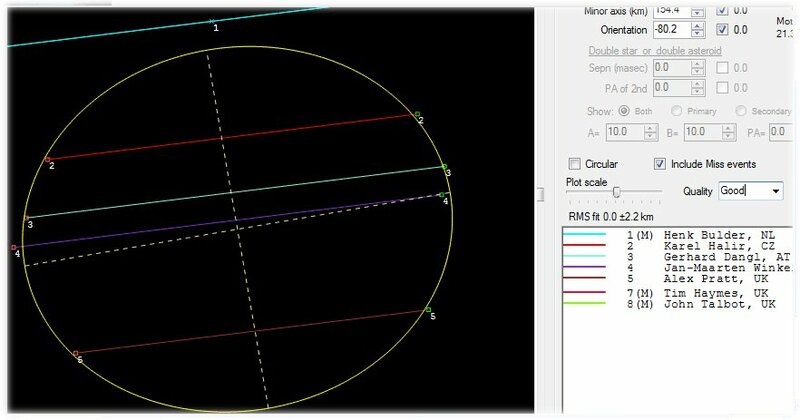 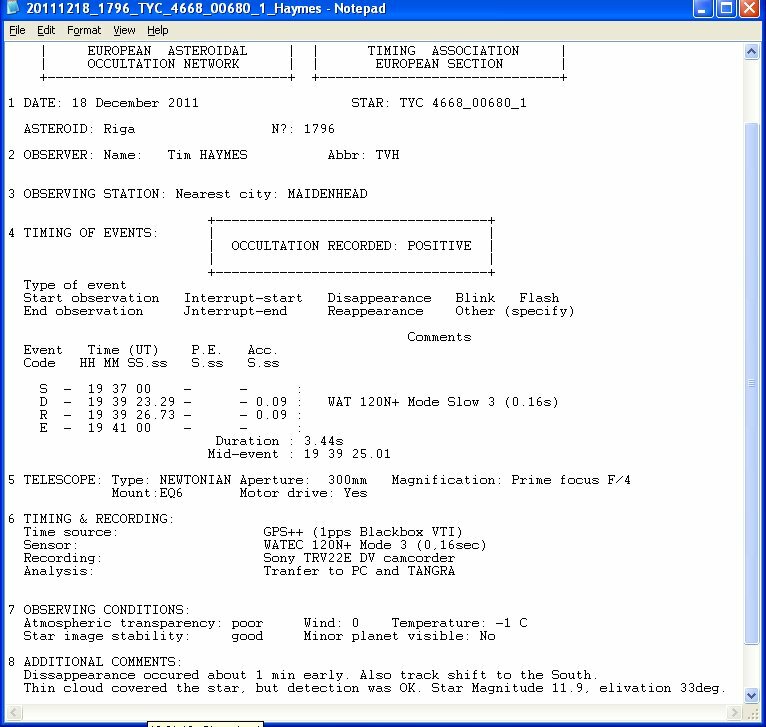 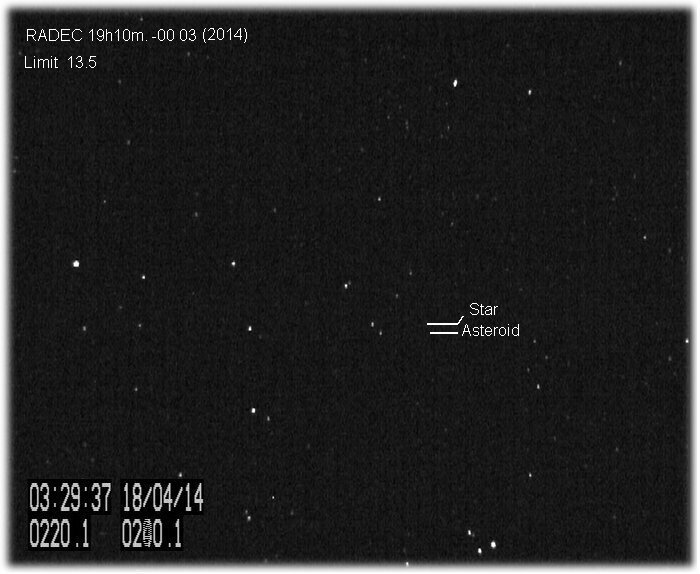 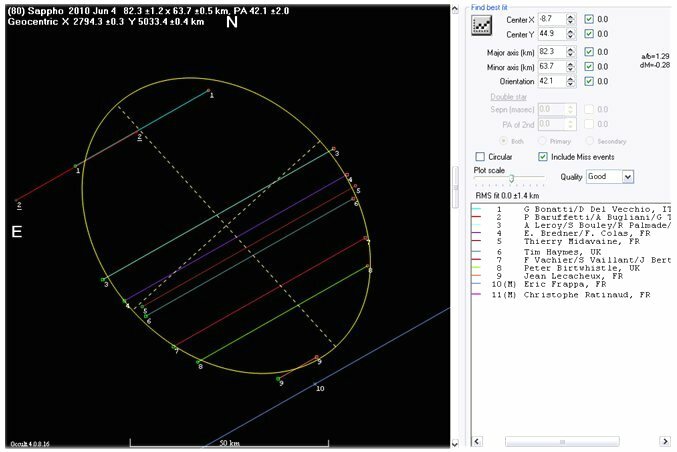 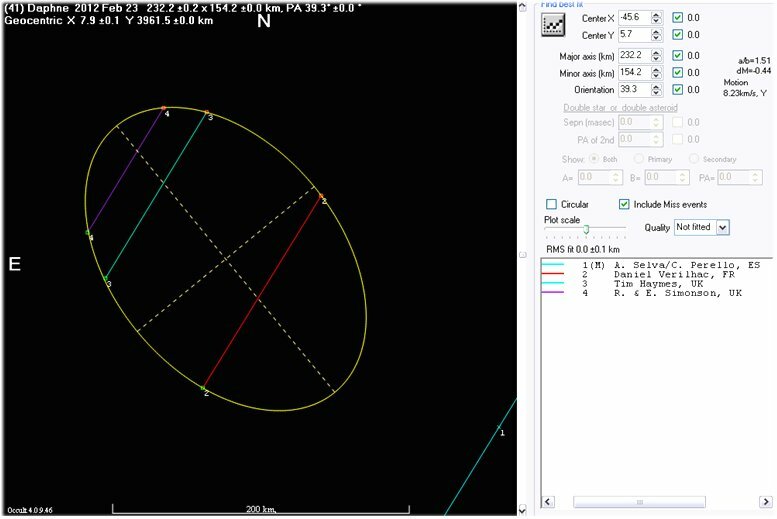 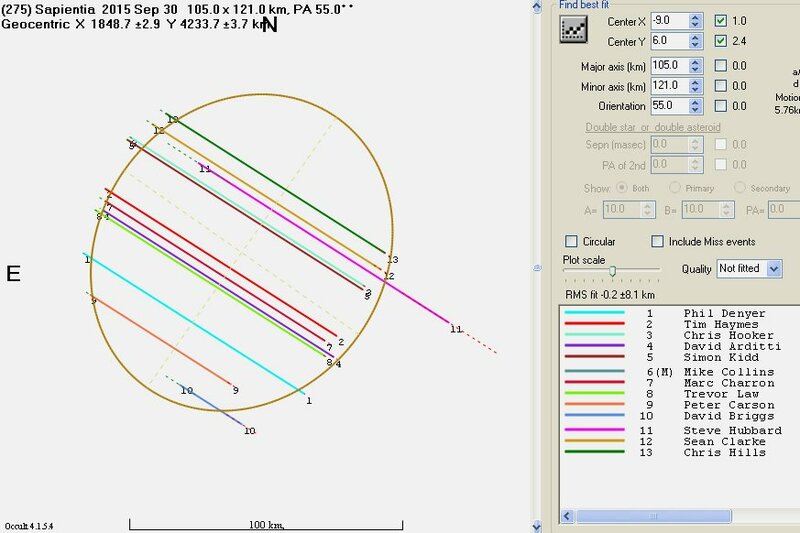 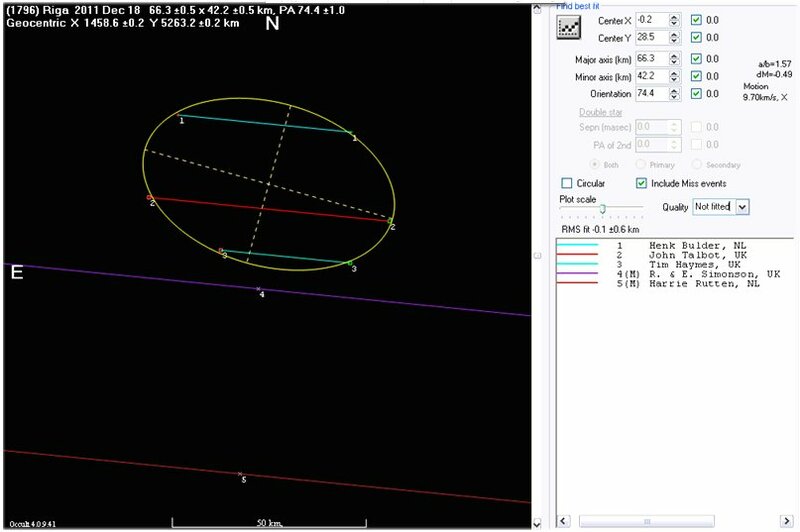 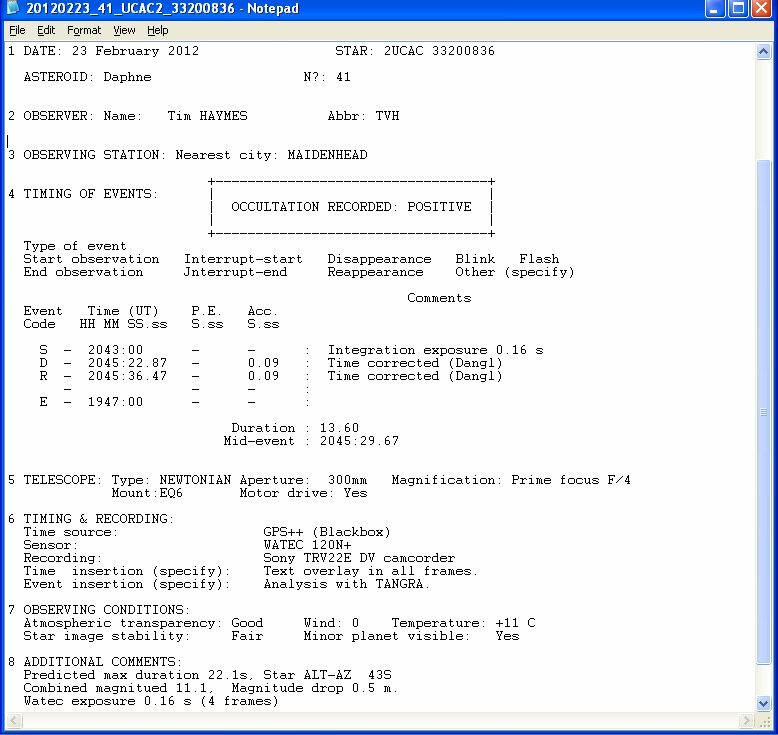 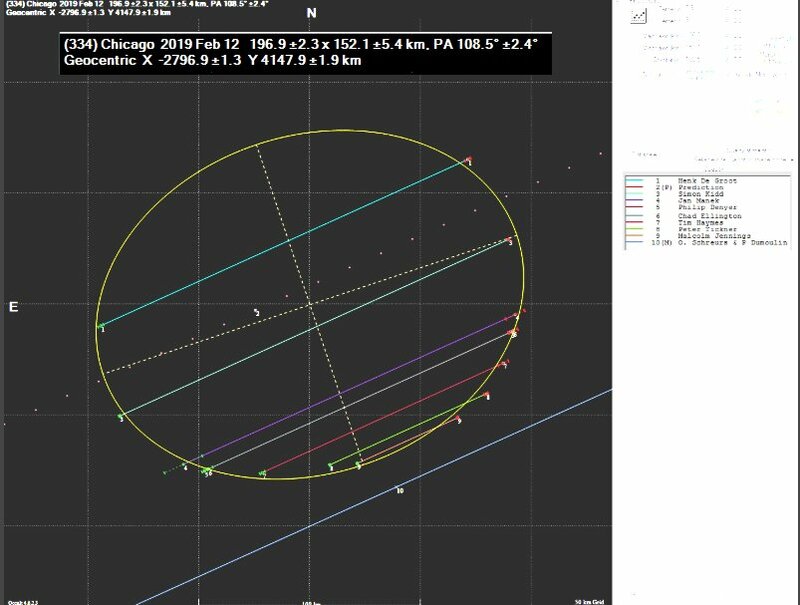 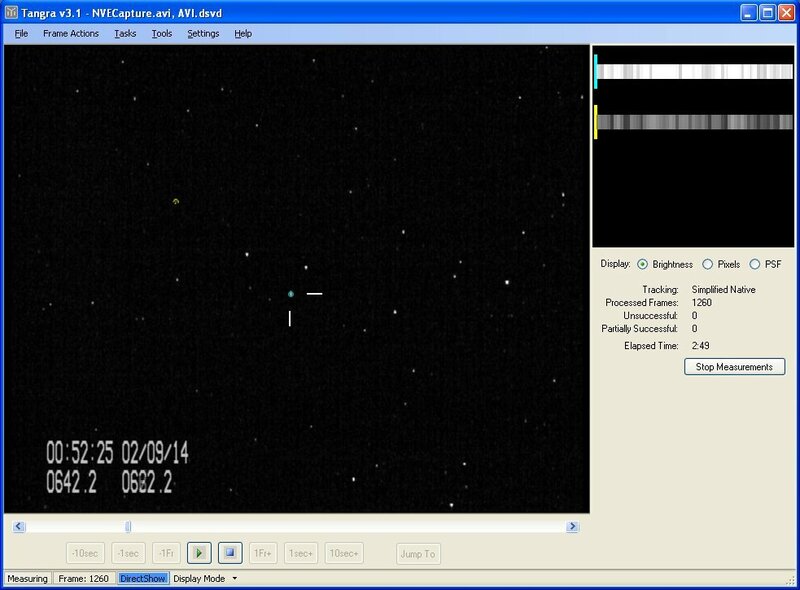 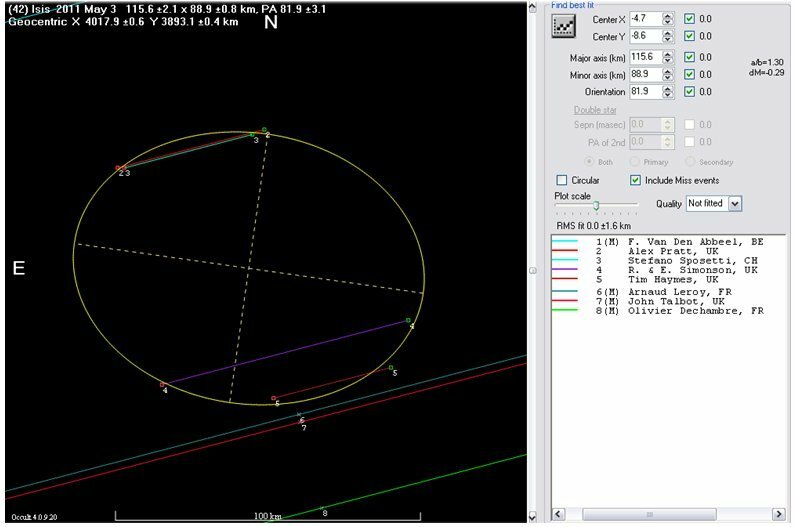 Three observers got chords across this 20km object. 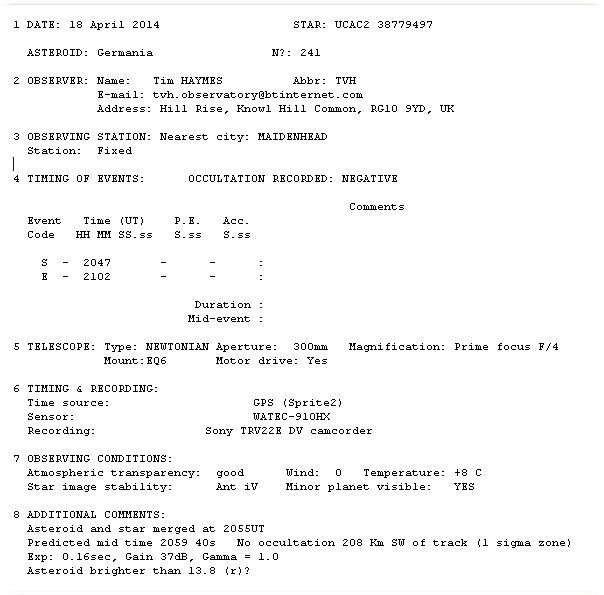 The preliminary Occult profile is elongated. 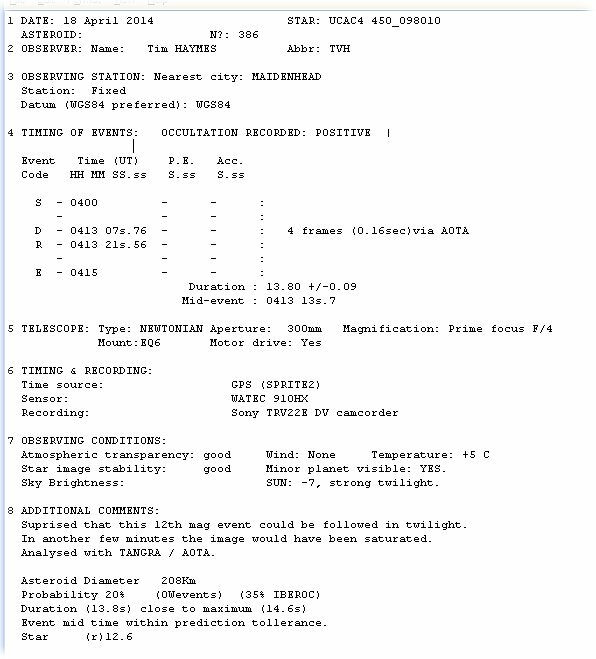 following an alert to BAA members. 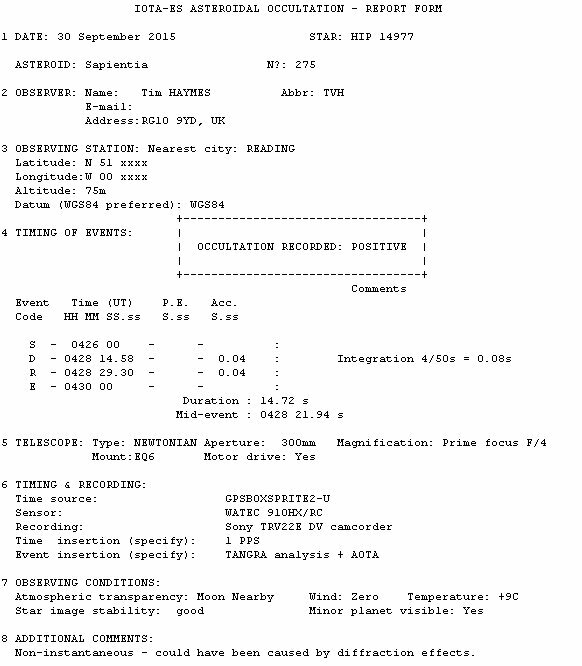 W25 red filter used in error. 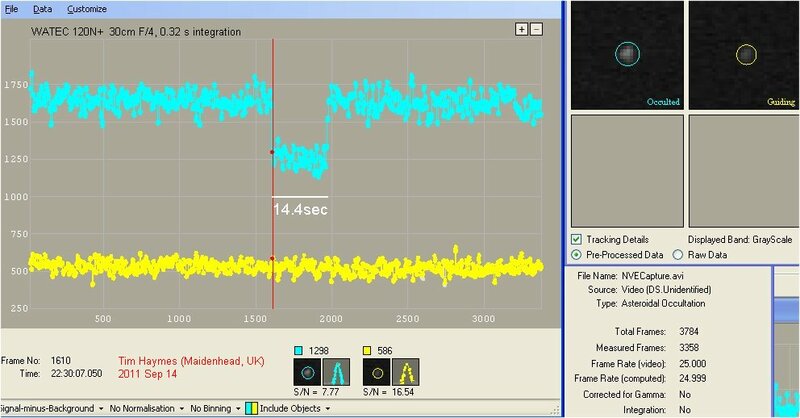 Laptop bat.. failed so used a cam-corder.